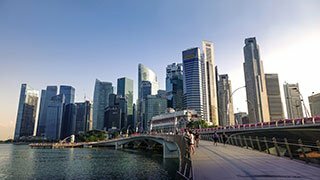 Starting a company in Singapore? AsiaBiz is your one-stop solution for all your business incorporation services. We provide a complete range of Singapore company registration, accounting, tax, immigration & compliance-related services. Our rates are highly competitive; however our services remain at its best with quality and timely processing of your requests and needs, so you know exactly what you are getting. Our website is packed with comprehensive information on how to incorporate your Singapore Company. Feel free to contact us if you need any support or require further clarification. We have incorporated thousands of companies to date, and we can assure you of a fast and swift incorporation process. If your documents are in order, we can expedite the process within an hour. Our friendly and efficient staff are professionally trained under prestigious institutions from the UK and Singapore. We promise you a timely reply during business hours. This is an Asian century, and increasingly companies from across the world, are moving to the continent to be a part of the burgeoning economies of India, China, and other South-east Asian nations. Here, Singapore, with its advantages of low corporate tax rates, no capital gains, and dividends taxes, high productivity, rule of law, availability of skilled man-power, and strict enforcement of intellectual property rights, provide the most conducive environment for such expansion and incorporation. To add to the above, company formation in Singapore, gives you the benefits of excellent connectivity and a strategic location, as Singapore’s Changi International Airport serves over 80 international airlines with connections to more than 330 cities. Business registration in Singapore is so hassle-free that the country consistently tops the World Bank’s ease of doing business report. Singapore was also rated as offering the best IP protection, infrastructure, and incentives in Asia by World Economic Forum’s Global Competitiveness Report 2015-16. 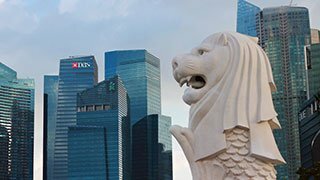 As regards to the availability of funding after you register a company in Singapore, the country hosts over 128 commercial banks, 31 merchant banks, and 604 capital markets services license holders. It is also the hub for wealth management and investments in Asia. To facilitate business and trading across borders, as well as minimize tax barriers, the country has signed over 21 free trade agreements (FTAs) with 27 economies and 76 comprehensive avoidance of double tax agreements (DTAs). The Singapore Government has played its part too in propelling the nation towards a thriving company incorporation ecosystem, with its flagship initiative, Startup SG, which provides a launch pad to entrepreneurs and give them a platform to access local support initiatives as well as connect to the global entrepreneurial network. Learn more about incorporating a company in Singapore, most common type of business entity and its registration requirements. Learn more about incorporating a Subsidiary company in Singapore including the requirements, procedure, and timeline. Learn more about Employment Pass (EP) for company owners, directors or skilled employees who wish to relocate to Singapore. We are a Pan-Asian, full-service professional services firm specializing in Singapore company registration, tax and accounting, immigration and corporate compliance. AsiaBiz Services, a member of In.Corp Global Group, has been servicing over a thousand corporate clients since 1993. We provide assistance with all your business’s regulatory requirements in Singapore including company formation, understanding corporate structures, personal and corporate income tax, GST, accounting, immigration advice and work pass applications. Your one-stop Singapore business incorporation service and corporate service provider! It is our mission to help businesses breeze through the Singapore company incorporation and immigration process and navigate their way to success. Our aim is to deliver unsurpassed time-efficient service, delivering premium value to our customers. Our team consists of experienced and qualified company secretaries (CS), company incorporation and work pass specialists, as well as qualified in-house accounting and tax consultants who can help you with all your business needs. 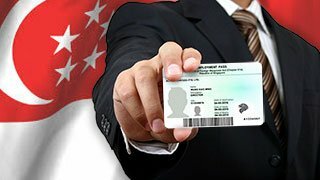 Application and renewal of Singapore Employment Passes made easy! Our immigration team will help you take the stress out of the employment pass application process. Be it an EntrePass, Employment pass or a dependant’s pass for their spouse and children, our team has years of experience and in-depth knowledge of the Singapore MOM system and we will make sure that you are always at ease in applying and securing the right work passes. Company formation in Singapore, and then running it stress-free, is possible with AsiaBiz by your side. We understand that every business has unique needs and goals, which is why we offer tailored services to suit your requirements. Whether you need assistance with company formation and nominee resident director services or virtual offices with mail support, we are here for you.